payments or benefits to achieve the consent of a person having control over another person, for the purpose of exploitation. Exploitation shall include, at a minimum, the exploitation of the prostitution of others or other forms of sexual exploitation, forced labour or services, slavery or practices similar to slavery, servitude or the removal of organs. 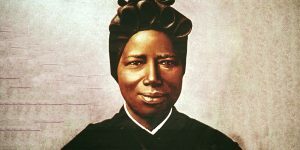 If it happens that you wonder why the Prayer to St. Josephine Bakhita, she is recognised as the Patron Saint of Human Trafficking survivors. Her universal feast day is on 8th February. She was born in South Sudan in 1869 and died on 8th February 1947. She was kidnapped by Arab slave traders as a young girl and put into slavery both in Sudan and Italy. Fortunately, she later gained her freedom and became a Canossian Sister. She was canonised on 1st October 2000 by St. John Paul II, the then Roman Pontiff. we honour and praise your name. and indeed throughout the world. are close to your heart. in their time of suffering and despair. of the children of God. Amen.